In a move that is sure to anger President Trump, the NFL's two-month old national anthem policy is on hold. As a reminder, back in May the NFL passed a rule that forbid players from sitting or taking a knee if they are on the field or sidelines during "The Star-Spangled Banner," but allowed them to stay in the locker room if they wish. The policy said teams would be fined if players didn't stand during the anthem while on the field. The league left it up to teams on how to punish players. The issue which has dominated headlines over the past two seasons, and was the catalyst for the eventual downfall of Papa John's founder John Schnatter, has led to division and alienated some fans. In response to the NFL's may decision, none of the team policies had been made public until the AP obtained a copy of Miami's nine-page discipline document. And, as the AP reported earlier, it included a one-sentence section on "Proper Anthem Conduct." 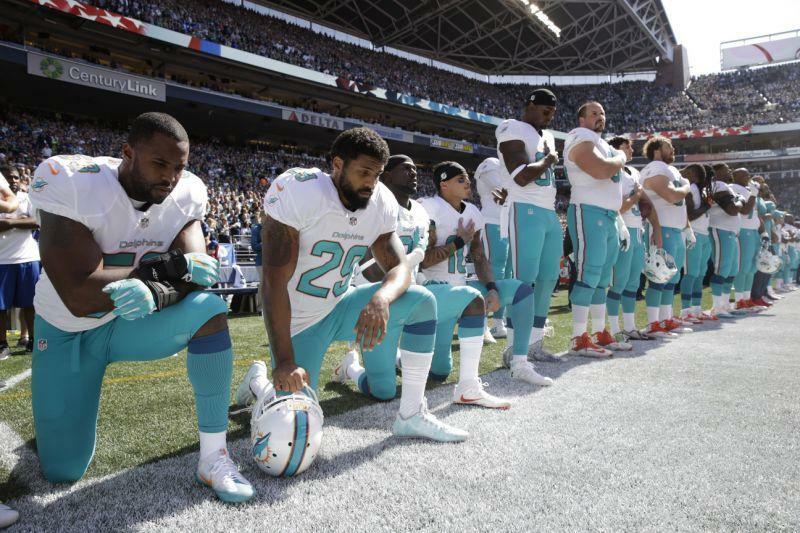 It classifies anthem protests under a large list of "conduct detrimental to the club," all of which could lead to a paid or unpaid suspension, a fine or both. According to the document, Miami can choose not to issue any suspension nor fine any player guilty of "conduct detrimental to the club." Other violations under that label include drug use or possession, gambling, breaking curfew and riding motorcycles as a driver or passenger from the start of camp until the last game of the season. Meanwhile, Jets acting owner Christopher Johnson said shortly after the league announced its policy that he will not punish his players for any peaceful protests — and would pay any potential fines incurred by the team as a result of his players' actions.